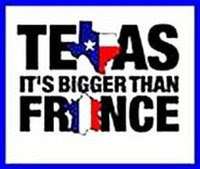 My, my, my, how do you write a post as big as Texas? A little bit at a time, that's how (and with absolutely no idea where to begin, hence the reason there's been nary a peep from me for a week). So since I've been having a hard time getting this going, I'm just going to go ahead and jump in all bumbly like. Or more precisely, me in Texas. Apparently as soon as I step back on Texas soil I lose all my mojo. Any sense of coolness disappears and I kind of bungle about bumping into things and tripping a lot (my nickname in Texas is Handy... short for handicapped... I'm not joking. For the record, I'm pretty sure that if The Husband had met me in Texas, we never would have been. I'm that dorky there. For reals). And the way my lack of mojo-ness decided to manifest itself on my very first day back in Texas was through a random and strange swelling of my lips a few hours after I arrived (it may have been an allergic reaction to the mohair couch I was napping on, but we'll never know, and it doesn't matter, it doesn't change the fact that I looked like I had over done the lip injections... which kind of made me blend in a bit in Dallas, so kind of a bonus). Yeah, so me and my big ol' lips went to dinner at The Porch in Dallas with The Husband and my dear friend, The Puma (last seen here). And you know what? Having big ol' swollen lips can really take it out of you, I was so exhausted, I couldn't even drink my martini (in fairness, it was like 5am French time, and I don't usually drink martinis at 5am). And while I was trying to keep my heavy head and big ol' lips upright, The Husband was tackling his over sized French dip sandwich and trying to figure out why it was 'French'. I told him to just go with it and enjoy the deliciousness. He did. The next morning I woke up with normal sized lips in time for the drive on down to San Antonio. It felt good to be back on a large open road seeing Cracker Barrels and firework stands on the side, and once I cruised by Austin on I-35, I knew that I was home. And as lame as it might be, that concludes the very first part of my Texas tale. I love that your husband ordered a French Dip! Was this encouraged or did he really want to try it? It is a pretty awesome sandwich! Can't wait to read more about your return to big Texas! No pics of the Dallas lips? Darnit. You weren't by chance eating habaneros as soon as you landed? Ya I want to see these lips! I know why you don't usually drink martinis at 5am; you're too busy finishing off the scotch! Great start, looking forward to hearing the rest. Did you encounter any of that heat or fires that have been consuming Texas. the Porch is my FAVORITE!!!! We just missed each other by a month! We were right down the street from there... have fun! Haha! You mean a french dip sandwich isn't French??? I'm glad you're back in France...mojo (and lips) in tact. "me and my big 'ol lips"....love it! Look forward to reading the rest!!! You must post a picture of the lips! You had me cracking up with this tale, so I'm looking forward to reading about the rest of your adventures. Not even sure how I stumbled across your blog, but I've been reading and laughing so I figured I should follow. I'm in California but travel to France almost yearly (and still can't speak a word of French...I say "Bonjour" and everyone immediately responds with "Hi") so I look forward to reading more from you. "It felt good to be back on a large open road seeing Cracker Barrels and firework stands on the side..."
are you back just visiting?? sorry I'm out of the loop! Yay I've been waiting for these posts!! Such a small world that San Antonio is home for you. Can't wait to hear about the copious amounts of enchiladas that I'm sure you ate. Oddly enough, I've never been to Texas. I'd like to check out Austin. 2. He's right about questioning the origin of it's name. Why the hell IS it called a French Dip...? Also- You need to take another nap on the mohair couch and take a pic of the Lisa Rinna lips.